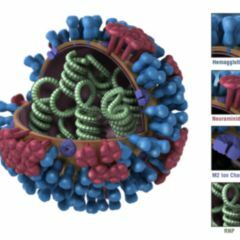 Right on time for the flu season, British scientists report a sensational success: In the future, so-called protective viruses can do in any influenza pathogens. Even a pandemia can be prevented that way. What Nigel Dimmock has to announce after 20 years of research, resembles a sensation. For the first time, the professor, teaching at University of Warwick , was able to prove in animal experiments, that influenza viruses can be transmuted to an immediately effective vaccine instantaneously after the affection of the host organism. This activates the body's immune system of the infected person – preventing any further spread of the viruses. Dimmock administered a solutions enriched with protective viruses to his patients. This is a matter of naturally occurring influenza viruses, but of those, which lost a great part of their genetic information by spontaneous mutations. Basically dead, they still contain some important information, which Dimmock and his team knew how to make use of. 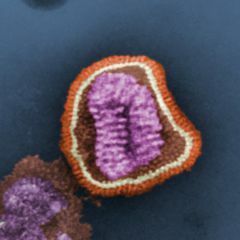 Because the viruses possess a similar RNA to the active influenza pathogens, but turned out to be harmless compared to their infective counterparts, since they neither spawn in the animal's body nor cause any other damage. Not until conventional flu viruses take possession of the host body, the queer fellows get active. What happens then, is rather astonishing. The slightest contact with a "real" influenza virus obviously ignites a genetic mechanism: The protectors seem to slow down the replication of the flu viruses by a not yet fully understood chain of signals. "Protective viruses prove to be a potent antiviral agent", Dimmock explains. But that's not it yet. As a matter of fact, the protectors not only paralyze the replication of the flu pathogens, but on top of that suddenly start spawning themselves. In a flash those still harmless mini-guardians surround the entering invaders – and transform them into a vaccine as well. The protective viruses bar the influenza viruses from a fast replication. By doing so, the body gains valuable time – the immune system learns about the intruding pathogens unhurriedly and finally starts producing the necessary number of antibodies. In case, protectors are abound, the process is similar to an infection in slow motion. The intruding pathogenic invaders serve as identification tags. The vaccine in real-time seems to come into reach. "We assume, that our natural protectors are suitable against all types of influenza A", says Dimmock. The researcher expects, even a pandemia can be avoided this way, because protective viruses, compared to conventional vaccines, do not need to "know" their enemy before – the first contact in the body of the infected person is enough to put them to work. As if that was not spectacular enough just yet, the team around Dimmock is coming up with another strength of the protectors. In the laboratory test, they still work 24 hours after an influenza infection. In animal tests, the protective viruses were active for a period of six weeks. Even the unpleasant pinprick in the arm might soon be something, the patient will do without, if Dimmock's visions will come true: "Protective viruses might be administered in a nasal spray in the near future".